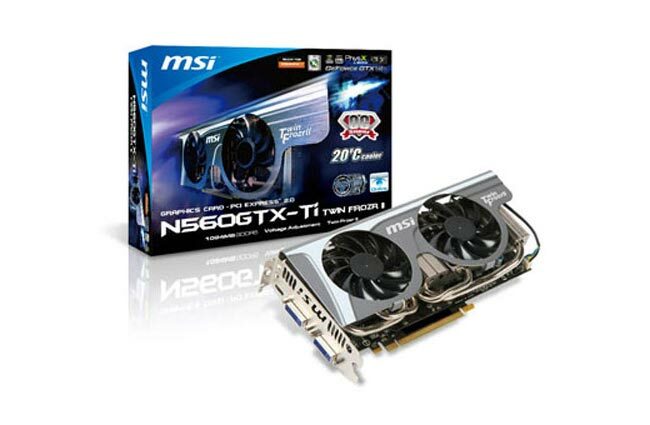 MSI has today announced a new addition to its graphics card line-up with the launch of the MSI N560GTX-Ti equipped with the Twin Frozr II cooling system ad fitted with the NVIDIA GTX 560 GPU. The Twin Frozr II consists of a large footprint copper base heat-sink with high density radiation fins, its equipped with dual 8cm temperature-controlled PWM fans, and has five heat-pipes designed to increase airflow and improve heat conductivity for the graphics processor and nearby components. MSi has also unveiled a Golden Edition N560GTX-Ti but unfortunately hasn’t offered any specifications as yet. But going on previous Gold Editions you can expect an overclocked version with a few extra features. Both cards feature Military Class II components for added protection against failure and added long life. MSi also unveiled its other N570GTX and N580GTX both with the MSi Twin Frozr II cooling system installed earlier this week.